Posey County – Indiana State Police and Posey County Sheriff’s Deputies investigated an incident involving a handgun last night on Elk Trail near Evansville that led to the arrest of Jeffrey Scott Wade, 33, of Nebo, Ky.
At approximately 9:25 last night, Posey County Dispatch received a 911call about a male relative that had just pointed a gun at Wade and left the area driving a beige pickup truck. Wade was visiting another relative at 307 Elk Trail when the incident occurred. The person allegedly pointed the weapon at Wade’s face and pulled the trigger several times, but the weapon failed to fire. As officers were responding to the scene they observed the vehicle driving north on West Franklin Road. Officers were able to stop the vehicle in the parking lot of a nearby gas station at S.R. 62 and West Franklin Road. While investigating this incident, officers were able to determine that a weapon was never used. Further investigation revealed that Wade and the relative, who allegedly pointed the handgun, were having a dispute over a vehicle. Wade was arrested and taken to the Posey County Jail where he is currently being held until he appears in court later today. 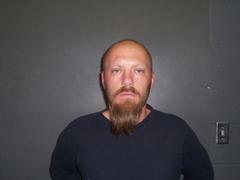 • Jeffrey Scott, Wade, 33, 11325 Nebo Road, Nebo, Ky.